Are you wanting to bring life back into that old saddle or your favorite pair of boots? Are not getting the soft feel you are looking for by using just oil? There is a reason for that. Whether using mink oil, neatsfoot oil, or olive oil, you more than likely are still finding your favorite leather products still seeming a bit dry and stiff. Although oils are essential for the life and care of leather goods, they alone are not sufficient for maintaining that feel that we all want in our gear. In this article we will discuss the difference between oils and conditioners. The biggest recommendation for caring for anything leather is always oil, but a high quality conditioner plays just as big a role in the life of a leather product. For the most part, everyone knows the importance of oiling leather goods to maintain its condition… even though many neglect this vital step. Leather is tanned in different ways depending on its intended application and some tannages produce a more hardy product that handles the elements better than others. An example of this would be that harness leather is more prepared for exposure to water than a vegetable tanned skirting leather straight out of the box so to speak. To keep from getting too deep into different leather tannages, let’s just agree that some leather types require more maintenance than others. But no matter the tannage or type of leather, all leathers need a certain amount of oiling to maintain their vitality. I look at the “oiling” part of leather care like the fuel needed to keep the leather alive. The purpose of tanning is to take dead animal skins and turn them into a useful material by stopping the natural decomposing process of living tissue. Although this process works extremely well, the leather will naturally decompose overtime if left to starve. The oil is what “feeds” the fibers of the leather and keeps it from dying. Through exposure and use, oil is lost on a regular basis and this supply of oil must be replaced to insure that the fibers do not dry out. This loss of oil happens spontaneously even with leather products that are strictly indoors and experience light use. Read more here on what oil I recommend for leather. So if oil is the fuel that must be periodically replaced to feed the leather, what is the role of leather conditioners in all this? A good quality leather conditioner can be thought of as the lubrication of a system. A car needs gas to drive you around town and on long trips, but it’s the grease in the bearings that keeps your wheels from flying off the car. Lubrication is important in leather to maintain its soft feel and to protect it from loss of oil through exposure. The majority of oil evaporation in leather is from moisture and heat. When leather gets wet and then dries, the water that evaporates takes some oil with it. Over time this getting wet and drying out process will rob your leather of essential oil. Conditioners of good quality natural ingredients help to lock these oils into the fibers by moisture proofing the outside of the leather. Ingredients such as tallows and beeswax help to create a barrier that prevents moisture from filling the voids between the leather fibers. This is where fats and tallows are used to make harness leather during the tanning process to help lock in the oil and create a leather type that is well suited for rugged outdoor use. Along with creating a moisture proof barrier against the elements, conditioner ingredients also lubricate the fibers of the leather making them softer and more pliable. This helps in the break in time and can actually restore dry stiff leather to a more supple broke in feel. There are many different types of leather conditioners on the market these days and the majority of them are pretty good. I have tried many of them and have pros and cons on them, but there is only one that I use and recommend on a consistent basis. Skidmore’s Leather Cream is the conditioner of choice in our shop. I have been using this product for better than 8 years and I haven’t found anything that works as well on both new and old leather. I have many customers that even use this product on couches, chaps, or even their leather seats in their King Ranch Ford pickups. All the ingredients in Skidmore’s Leather Cream are all natural and the cream is completely handmade by Vince Skidmore in his shop. The ingredient in this product that I am so excited about is beeswax. Beeswax is one of the main ingredients in this product and the reason for its superb moisture protection capabilities. Many conditioners on the market do a great job of lubricating the leather but fall short when it comes to moisture proofing. 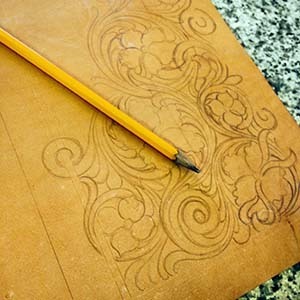 Although Skidmore’s makes other products for extreme waterproofing of leather as well as products for wood applications, I only have experience with the Leather Cream. In our repair shop, we go through a gallon of this conditioner every 6 weeks or so. Every saddle we clean as part of our repair service gets a wipe down with Skidmore’s. Visit their website or find a can of this in almost any local feed store and give them a try, you won’t be disappointed. 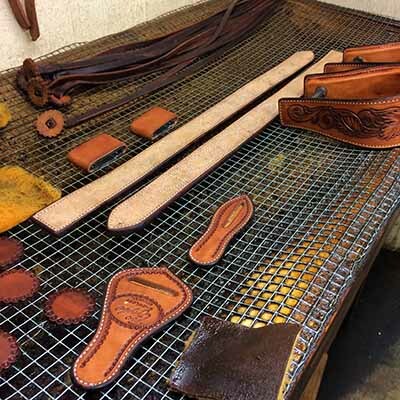 If you found this article useful or have any questions concerning leather care and maintenance, please feel free to send me an email and I would be glad to help. Also, don’t forget to sign up for our newsletter to receive the latest from our blog.